Comments: ALTERNATE EDITION: Brand new book. INSTRUCTOR'S EDITION. Never used. Nice gift. Best buy. Shipped promptly and packaged carefully. ¡A QUE SÍ! 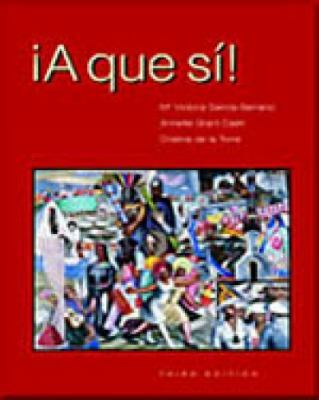 is a provocative post-intermediate Spanish conversation book that will motivate your students. Learners develop an important cultural awareness and build the confidence they need to express opinions through oral and written discussion on a variety of timely, personally relevant issues. The book's highly acclaimed thematic organization focuses on topics of general contemporary relevance, which help raise awareness and understanding of Hispanic and global issues. Each thematic unit is supported by creative activities and engaging authentic materials, including dozens of new selections in literature, journalism, films, songs, and cartoons.De la Torre, Cristina is the author of 'A Que Si! ', published 2004 under ISBN 9781413003901 and ISBN 1413003907.